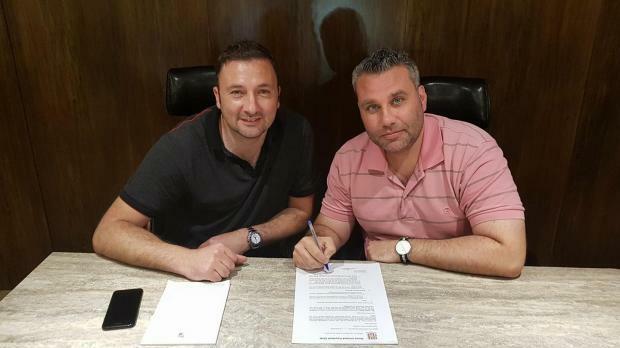 Darren Abdilla (right) has resigned as coach of Gżira United. Darren Abdilla has resigned as coach of Gżira United and was replaced by Jesmond Zerafa, the Premier League club announced yesterday. Abdilla took the decision following the team’s 1-0 defeat to Hibernians on Sunday which left the Maroons six points adrift of the Paolites and Valletta who are sharing top spot in the Premier League standings. “Darren Abdilla has today departed his role as Head Coach of Gzira United Football Club,” the club said in a statement. Sharlon Pace, the Gżira United president, said: “I’d like to begin by thanking Darren for all he has achieved at Gzira United over the last five years. Under his stewardship, we’ve achieved things on the football pitch that surpass anything in modern memory, and that have gone well beyond my wildest expectations as president and as a fan. “Under Darren’s management, we took this Club to the highest position it has held in almost 50 years and created memories that will last forever. “As I had said previously, I had no intention of sacking Darren. On his part, Abdilla revealed that his initial resignation was turned down by club president Pace but pressed on his decision as he felt it was in the best interest of the club. “My time has come. As from today I’m not in the helm of Gzira United. I offered my resignation and after it was turned down by our President, I insisted that it was for the best interest of the club. “I always felt that even though the coach is not always to blame he should be mature enough and put the best interest of the club before his. I shoulder all the responsibility, for the team’s performance. I leave the club in a European competition place and in the quarter finals of the cup with only 9 matches to go. “I have a broken heart as this club was my family and this was my job. I leave behind great memories and was very proud to write history for this club. I only have words of praise for this club which I spent almost five years and was on the touchline not less than 124 games. “I want to thank all the players who I coached, committee members, sponsors, staff and supporters for all their memories. My heartfelt thanks goes to my loyal staff Andrew, Johann and Domenic. “I need to thank Marlon who was a very important person throughout this journey. But my biggest gratitude goes to the beloved President, Sharlon Pace who believed in me from day one. All what I achieved in football was thanks to him. Thank you for always being honest, for helping me and for your friendship. You are a great gentleman and one of a kind. Thanks Pres. “I hope that we cross paths again in the future. For Zerafa, this will be a return to club management after a few years and this season he had already been involved with Gżira United after taking an administrative role at the club. Zerafa will make his debut as Gżira coach against Birkirkara on Sunday.